Select the thumbnail image above for a larger photo which opens in a new window. 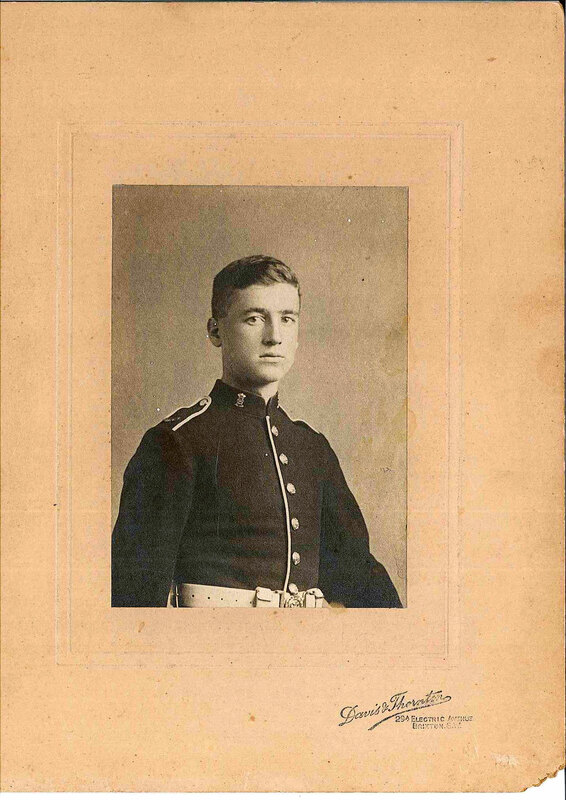 Lance Corporal Horace John KING. 9311. 2nd Battalion the Yorkshire Regiment. Son of Arthur King, of 59, Ingram Rd., Thornton Heath, Surrey, and the late Eliza Ann King. Educated at Royal Hibernian Military School, Dublin. Killed 4 November 1914. Aged 19. Born Harwich (Ipswich, Suffolk), Enlisted Dublin, Resided West Norwood (Surrey). Commemorated on Panel 33, YPRES (MENIN GATE) MEMORIAL. A photograph of Horace King has been forwarded by a great nephew of his, Simon Miller (<Simon.Miller@nightingaleassociates.com>). The portrait would appear to show Horace King in the uniform of the Royal Hibernian Military School, and was taken by Davis & Thornton of Brixton, London. Army Medal Office rolls confirm the award of the 1914 Star and Bar, recording his date of disembarkation as 5 October 1914. He was born 25 November 1894 at Married Quarters, Harwich, the son of Arthur King, Master Gunner, Royal Artillery, and his wife Eliza Ann (née Wood). Regimental Heaquarters has no details of his enlistment, which his number indicates was early in 1911. The Commonwealth War Graves Commission records that: he died 4 November 1914; he was the son of Arthur and the late Eliza Ann King of 59 Ingram Road, Thornton Heath, Surrey; he was educated at the Royal Hibernian School, Dublin; he was age 19; he is commemorated on the Menin Gate at Ypres. Soldiers Died In The Great War records that: he was born in Harwich, enlisted in Dublin while residing in West Norwood, Surrey, and was killed in action France & Flanders 4 November 1914. On 4 November the 2/Yorkshire Regiment was in reserve, occupying dugouts opposite Gheluvelt. The War Diary records that it was a very quiet day. He may therefore have been killed either 3 November, when four men were killed and six wounded as a result of artillery fire, or 5 November, when the battalion was subjected to another heavy bombardment.